Another big snow is on its way. Some of the snow already on the ground melted over the weekend, but not much, and the Meteorologist Spencer Mell with the National Weather Service in Kansas City says 12 inches or more is expected for the Greater Kansas City region. 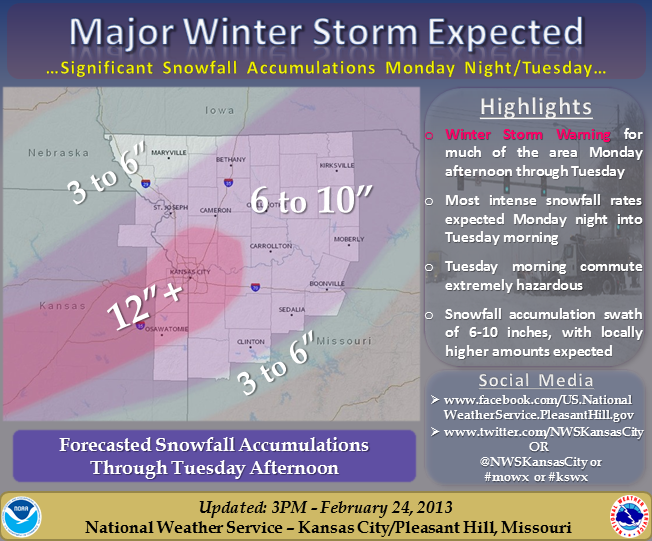 Central Missouri and surrounding areas can expect six to 10 inches. The snow is expected to start in Western Missouri around four today and then will ramp up tonight, tapering off by tomorrow afternoon. Mell says there are two components of the storm that make it especially dangerous. Winds up to 30 miles per hour or more could lead to drifting … and with snow falling sometimes at a rate of two inches per hour or more, whiteout conditions are possible. He says that rapid snowfall will make it difficult for snow plows and road crews to keep up with removal. For weather updates, follow us on Facebook and @Missourinet on Twitter. The latest forecast is laid out in the graphic below posted by the National Weather Service in Pleasant Hill (Kansas City).